Why Won't You Grow?! : The last days . . . Napa? Meh! You have probably already heard my audioblog as we exited the airport this afternoon, summing up our feelings on arrival back in Ohio. We ARE glad to be home. The kids were excited to see us and really didn't care that much about the awesome souvenirs that we brought back for them. I suppose being happy to see us is the better choice. But, Tegan did take pictures of our last two days out west, so I dutifully place some of the most evocative ones here for your amusement. It really was true that if we had come home on Sunday we would have saved several bundles of cash and probably would have a better overall feeling about the trip. What was different? 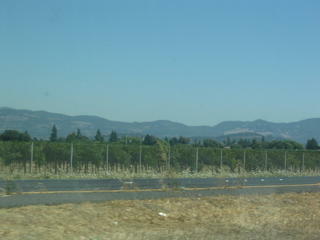 Well, Napa just isn't our thing. We don't care THAT much about wine. I mean, I like to drink it and it goes well with food. And I'll enjoy learning about how wine is made and take a tour of a winery (we didn't) if you price it reasonably and tell me some interesting stuff. But, to just drive around, pay people to sip their wine, and call that a day? We gave it a brief try, but decided we just didn't care that much. So, we wandered around some of the towns in the Valley, saw some sights, ate expensively priced food (as ALWAYS on this trip), greatly enjoyed warm temperatures and bright sunshine. We did go the to Napa Valley Museum, which was free on Mondays. 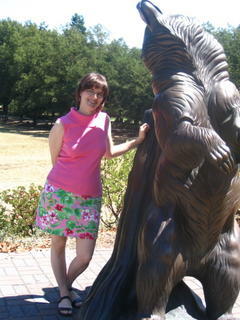 Here is Tegan beside a statue of a bear. It was outside the museum. Another reason that things might have been more stressful and less leisurely on the last few days was the additional of the rental car. Besides adding another expense, for a part of the trip that we came to minimize, the two of us driving around in unfamiliar territory is always cause for some tense words, missed road signs, badly interpreted maps, etc. It always happens, it always will, and we continue to love each other and vacation in the future. Oooh, look. 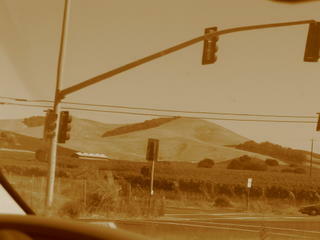 The sepia feature on the camera makes this one look all "Grapes of Wrathy" or something. Once we'd had our fill of Napa, we chilled at our less than stellar Holiday Inn in Vallejo (remember the one right across the street from the Six Flags?). The next day (our last non-travel day) we drove back to San Francisco, across the Bay Bridge this time and to our hotel near the airport. 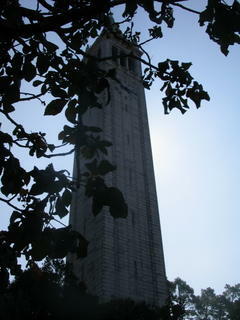 But along the way, we spent an hour or so wandering the Berkeley campus. Tegan took a few more shots on another pretty day. Here is a clock tower. I wondered if something important happened there in the Sixties, but maybe I'm getting it mixed up with the maniac in the U.T. clock tower. There was one odd moment when I was thinking of how on of my history books treats the Free Speech Movement at Berkeley, showing some pictures of student protestors and wondering if I might recognize the appropriate buildings, when Tegan points out that we are walking past the Free Speech Cafe. Odd. 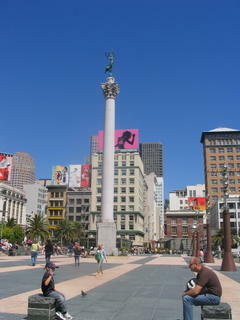 After Berkeley, we headed back downtown into the Financial (downtown) District of San Fran. 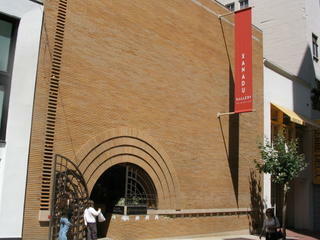 Tegan wanted me to see a building that we had noticed marked on a map simply as the "Frank Lloyd Wright" building. I could not remember him doing anything significant in downtown San Francisco, but I wanted to see it if I could. a squat, brick structure that was more modern looking than all the other buildings. The archway out front reminded me of another Wright archway in some other city, but what really clinched it was the interior. I didn't take a picture, because it is now an art gallery of sorts, but the interior is clearly like the Guggenheim's spiraled ramp structure. This building, the V.C. Morris Gift Shop was built before the famous New York museum, and this spiraled interior was Wright's attempt to refine the design in a smaller space before he did it in New York. 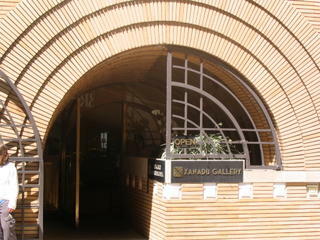 The ceiling of this gift shop/art museum also reminded me of the interior ceiling treatment of the Johnson Wax Building. I was glad that I got to see it. That's one more FLW structure that I have been inside. 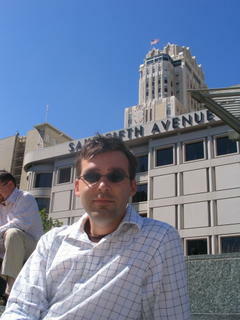 Then we relaxed outside in the sun at Union Square. We ate cheesecake in the bright sunshine and tried not to think about returning to the work-a-day world. It was a great vacation overall and we were very happy to have this time together. Thanks especially to Tegan's parents who braved the parenting of two young children for a week while we had fun. Thanks for another travelogue installment, including critique of your own choices. In the end, it appears that you did the Wright thing - hahaha. "Once we'd had our fill of Napa, we chilled..." also deserves a mighty groan! Your efforts have given your loyal readers a bit of vicarious vacation on your nickel. Welcome home.